I wasn’t too sure what to expect when I picked up this book, it’s obvious that it’s going to have a religious slant but how much of one is the question. I’d say Jill Bond is like a very Christian, very open about her faith, version of the FlyLady, Marla Cilley. Dinners in the Freezer is more than a freezer cooking book or method, it’s a household management system of which dinner is just a part. She gives advice on overcoming negative self talk, parenting, choosing healthy foods, what the bible says about nutrition, where to shop, and how to get deals, all with tons of personal family stories. For example, she says that if a sales person offers a sale for today only her family answers that if they can’t go home and pray about it it’s not for them. I wasn’t too impressed with the recipes. First, they have ambiguous names like Aunt Eloise’s Casserole, Evan’s Mom’s Casserole, Y’all Soup and Red Square. Second, many of them included things like canned soups, velveta, oleo and fructose- butter and sugar substitutes respectively. Jill suggest using half as much fructose as sugar but list both in the recipe as an either or thing so you don’t actually know how much you should be measuring out. Also in her examples of multiplying the recipes she often states that a recipe times five yields eight family size meals. I have no idea how that works, unless she’s just stretching the meals with side dishes. 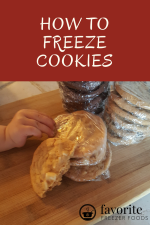 On the other hand, if your looking for tips about getting your kids to try new things and help in the kitchen you’ll find tons of ideas here. This book has no index and no photos, but there are illustrations drawn by Jill’s son Reed. There are also quite a few worksheets to help you get started and organize your freezer cooking. If you want to read a personal story about how a Christian woman manages her house, her family, and her freezer cooking days, this book is for you. 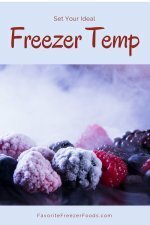 Read more freezer cooking cook book reviews. Return from Dinners in the Freezer to the homepage of Favorite Freezer Foods.